Conservation is a win-win strategy. By using less, you ease the stress on precious natural resources like water and fossil fuel, and you save money by reducing resource usage. At Precision Air, we have high expectations for energy conservation, and we deliver solutions that drive consumption to new lows. 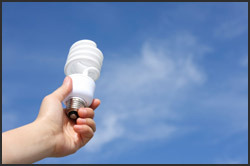 A great place to start your energy conservation campaign is with a home energy audit by Precision Air. We perform a thorough evaluation of your home using advanced diagnostic equipment and provide a written report that maps out your conservation options step-by-step. Our standard heating and cooling installations often reduce fossil consumption by more than 30 percent. 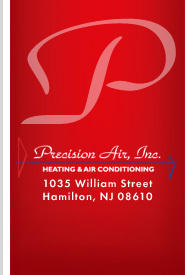 To jump-start your energy conservation efforts, please call Precision Air today or send us an e-mail. Here are some conservation tips to help you save electricity, use less fuel and reduce water consumption. Unplug seldom-used appliances. They drain current even when idle. Unplug chargers for cell phones and other devices when they are not in use. Set computers to go into sleep and/or hibernate mode when they are inactive. Set your refrigerator temperature between 38° and 42° and freezer between 0° and 5°. Run your dishwasher only when it is full, and use short cycles unless the dishes are exceptionally dirty. Dry clothes on a clothesline when possible. When using a dryer, clean the lint screen after each load. Install ceiling fans. They could cut your energy bill by 40 percent. And reversing fans for upward airflow will move warm air down in winter. Install motion-activated switches that automatically turn lights on and off. Use task lighting to target work and leisure activities. This lets you reduce your overall room lighting levels. Upgrade to ENERGY STAR® energy-efficient heating equipment, which can save 10 to 40 percent on energy bills and may also improve the comfort level in your home. Use kitchen, bath, and other ventilating fans wisely. In just one hour, these fans can pull out a houseful of warmed or cooled air. Turn fans off as soon as they have done the job. Insulate long runs of hot-water supply pipe, especially sections that pass through unheated spaces. Check your threshold for any gaps between it and the door. 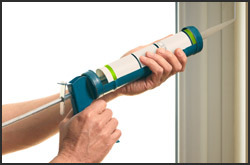 Use a bottom seal that can be attached to the bottom of the door. It should brush up against the floor to seal up the threshold. It virtually stops drafts. If you have a furnace, clean or replace the air filter once a month to assure the best airflow and efficiency. Make sure that furniture or draperies do not block heating vents. Re-glaze window glass (glazing is the putty that seals the glass to the frame). You can use a putty knife or glazing gun. Re-glazing stops air infiltration on the sash (window frame) itself. You can then install a V-strip to stop any leaking that would go around the sash. This also makes the window easier to operate up and down. Lower the temperature of your water heater from 140° (medium) to 120° (low). You'll save 3 to 5 percent in water heating costs for each 10° reduction. Install water-conserving fixtures, such as showerheads, faucets and toilets.  If your shower fills a one-gallon bucket in less than 20 seconds, replace the showerhead with a water-efficient model. 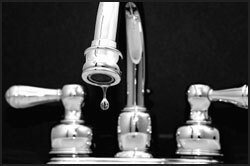 Fix leaky faucets, especially hot water faucets. Adjust lawn sprinklers so only your lawn is watered and not the house, sidewalk, or street. For cold drinks keep a pitcher of water in the refrigerator instead of running the tap. This way, every drop goes down your throat and not the drain.